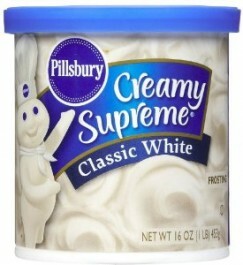 Pillsbury Creamy Supreme Classic White Frosting to make your cake, cookie or brownie even more delicous. It's easy, creamy and fun! You can add this frosting to the Pillsbury Moist Supreme Classic White Cake Mix. Sugar, Partially Hydrogenated Vegetable Oil (Soybean and Cottonseed Oil), Water, Corn Syrup, Corn Starch, Contains 2% Or Less of Each of The Following: Artificial Flavor, Salt, Mono- and Diglycerides, Artificial Color, Modified Corn Starch, Polysorbate 60, Potassium Sorbate (Preservative), Soy Lecithin, Citric Acid.